Game Preview: Beat ‘Dem Saints! Here we are, one day away from the NFL season opener in which the Vikings will be hosted by the last team to beat them. The team that ended the Vikings Super Bowl run in 2009. The Super Bowl Champion New Orleans Saints. The game is so highly anticipated that it is sure to have a Super Bowl atmosphere as Brett Favre returns for his 20th season to take on the team that was almost able to claim credit for making his retirement decision for him. Here is my breakdown of what will be the deciding factors throughout the game. Brett Favre completed 60.9% of his 46 passes in the NFC Championship Game against the Saints last year, two of which ended up as interceptions and one of which was a touchdown. His 310 passing yards were not quite enough to overcome the high flying offense of the Saints and the self-inflicted wounds that were Vikings turnovers. The Saints were able to constantly pressure Favre and get some hits on him, dirty or otherwise, but were never quite able to bring him down for a sack. It will be imperative, to this game and the long term hopes of the team, that the offensive line protects Favre with very few inconsistencies. One thing that should worry fans is that Favre has had slow starts to his seasons when he has not participated in training camp. For example, last season he only threw for 110 yards in the season opener against the Browns and 155 yards against the Lions. He topped 300 yards in week three against the Niners, but the game was not one of his best performances outside of the spectacular final throw to Greg Lewis. In 2008, it took Favre a few weeks to get comfortable with his new Jets teammates and he didn’t really turn it on until week four. Not every question mark in this passing offense centers around Favre and the offensive line. The pass catchers he has at his disposal are looking a little thin given the absence of Sidney Rice. Rice was Favre’s top target in 2009, as he hauled in 83 catches for 1,312 yards, both of which were team highs. Favre will have to work with Bernard Berrian, Percy Harvin, Greg Camarillo, Greg Lewis and Visanthe Shiancoe as his primary group of pass catchers. None of these players has ever had a 1,000 yard season. The Saints gave up 236 yards of passing in each of their preseason games. In the four exhibition games they notched two interceptions (one for a touchdown) and eight sacks. Injuries have forced Darren “big mouth” Sharper out of the opening lineup, and Tracy Porter has been limited in practices. I honestly believe that the Saints have a decent, but not great, pass defense that will be facing off against a Vikings passing attack that has too many questions that are unanswered at this point. Player To Watch: Adrian Peterson has rushed for 100 plus yards in every season opener of his career. He also ran for 122 yards and three touchdowns against the Saints last postseason. While I expect Peterson to be spectacular running the ball, I think he will play an important part in making or breaking this passing offense. Expect Peterson to have 4 to 8 passes thrown his way on Thursday and also to be called upon to protect Favre against the zero-blitz. How he handles these duties in the passing offense will be paramount. Adrian Peterson could be set up for a huge opener on Thursday. If the offensive line can play competently, then Peterson should be in line to continue his success against the Saints. Last postseason, he ran for 4.9 yards per carry against the Saints. While the preseason means little, it is noteworthy that the Saints allowed 115.8 yards of rushing on average, which tied them for a ranking of 24th throughout the preseason. It won’t help that the Saints are incredibly thin at linebacker after numerous injury issues and that defensive tackle Anthony Hargrove was suddenly placed on the injury report after missing Wednesday’s practice with a knee injury. 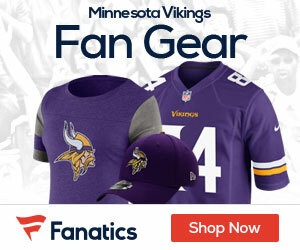 Peterson seems confident that his fumbling problems will be lesser this season, and the Vikings also have a pair of promising youngsters in their backfield in Albert Young and Toby Gerhart. To what extent these two see the field will be an interesting note following the game. Plus, there is always the possibility of Bernard Berrian or Percy Harvin running a reverse or something to keep the defense on their toes. To be honest, I see absolutely no reason that the Vikings shouldn’t be going into this game thinking “run” and why they shouldn’t find success. If something goes wrong, it seems almost certain that the offensive line did not perform at a high enough level. Player To Watch: After missing a great deal of training camp and preseason, John Sullivan is expected to start at center. I personally thought that Sullivan was the weakest link along the offensive line in his first season starting last year, and will be interested to see how he has progressed. His improvement is essential to the success of this run game. The back end of the Vikings defense is perhaps the most worrisome part of this team. With Cedric Griffin and Chris Cook presumably out for this contest, the Vikings will only have three healthy cornerbacks to defend against Drew Brees and his four and five receiver sets. In addition, the starting strong safety battle seems to have been resolved in an unforeseen way. Word out of Winter Park is that Husain Abdullah will get the start over Tyrell Johnson and Jamarca Sanford, who were thought to be the main competitors in the position battle. Sanford is banged up and his status is unclear. It sounds as if Abdullah will become a dime back should the Saints truly spread out their offense. Madieu Williams appears to still be the favorite to start at free safety. Antoine Winfield, Asher Allen, and Lito Sheppard have their work cut out for them Thursday night. Marques Colston, Devery Henderson, Robert Meachem, Lance Moore, and Reggie Bush make up a talented receiving group that can give even the best secondaries a run for their money. I have no faith that this secondary can match up well against the Saints receivers if Drew Brees has time to throw, and that is really what this comes down to. The Vikings have one of the most feared pass rushes in the NFL and they have to show up Thursday night if they want to win this game. With time, Brees will pick this defense apart and have plenty of big plays. If Jared Allen and company can constantly pressure Brees, however, he may make just enough mistakes to keep them in check and may have to resort to quick, short throws. If the Vikings front four can force the issue and the Saints begin “taking what they can get,” then the secondary’s job gets much easier in that they just have to prove to be efficient tacklers. There is a lot that has to go very well for the Vikings to stifle the Saints passing attack, but with discipline and a solid pass rush, it is doable… barely. Player To Watch: When Ray Edwards has an “on” game he can be a downright force. With offensive lines focusing on keeping Jared Allen and the WilliamsWall at bay, the opportunity will be there for Edwards to be the difference maker just like he was against the Cowboys in the playoffs. Edwards’ attitude is sometimes troubling, but this is a statement game for the Vikings and Edwards has said a lot of words about it. Now it is time for him to back up those words via actions. Constant pressure from Edwards will be the most surefire way to throw a wrench in Brew Brees’ plans and also it will be the best way to shut up that crowd. Hey, Saints, here is some free advice: Give up on running the ball right now. I can listen all about Pierre Thomas and his rushing average last year. I can listen to Saints fans go on and on about how good their interior line is. I can sit through an hour of NFL Network and listen to some talking head tell me about the Saints being ranked sixth in the run last season. In the NFC Championship Game, the Saints ran for 68 yards as a team against the Vikings always-stout run defense. The Vikings stopped the run all preseason and there is no reason to expect it to be any different in the 2010 regular season. If anything, they might be better since E.J. Henderson is back on the clock and the depth guys on the defensive line have noticeably improved. Look for the Saints to try and run the ball a few times, but they will have little success and will quickly abandon the run and resort to passing most of the time… as they should. Player To Watch: All indications are that run stuffing middle linebacker E.J. Henderson will not be held back one bit in the season opener, despite his fast paced recovery from a broken leg suffered last season. Henderson has always been pegged as a liability in the passing game, but his knack for taking down the ball carrier puts him in the upper tier of middle linebackers. Henderson may struggle in coverage, but if he provides the icing on the cake that is the Vikings run defense, then the issue will be pushed and the Saints will have to throw the ball. Watch for Henderson to rebound from his injury in a big way… by leading the Vikings in tackles Thursday night. The success of the offense could very well determine the success of the special teams. If the Vikings are punting often, then the coverage unit will be tasked with the daunting task of containing Reggie Bush, something that has been an issue for them in the past. If the offense scores often, however, then we will kickoff to Courtney Roby who is no slouch but less dangerous than Bush. The Vikings have some return weapons of their own in Percy Harvin and Bernard Berrian. Harvin is feared as a kick returner and Berrian has been impressive in his limited time spent as a punt returner. Then, you have the kickers who could very well decide this game. Ryan Longwell is one of the most dependable field goal kickers in the league, but Garrett Hartley can no longer be overlooked after his leg gave his team an overtime win against the Vikes and sent the Saints to Super Bowl. Everyone expects fireworks on Thursday night, and the special teams portion of the game is just as likely to feature big plays as either offense or defense. Player To Watch: Chris Kluwe was put on notice two years ago when he was unable to punt away from deadly return man Reggie Bush. Kluwe has reportedly been working on his directional punting this offseason, and his ability to avoid Bush but still gain the Vikings defense some field position could very well be a subtle but deciding factor in this game. If I am honest with myself, and put my fanhood aside, I can easily see why the Saints would be favored in their home opener against the Vikings. On paper, their passing attack should be able to light up the Vikings secondary. They should be able to score at will. The same could have been said last year, however, and they didn’t score at will at all. In fact, in the Championship game Drew Brees couldn’t even top 200 yards in passing. No receiver had more than 40 yards receiving. In fact, their offense only gained 257 total yards. The Vikings won that game in the trenches, but it was big mistakes (i.e. turnovers & too many men in the huddle) that decided the game. I think that the Vikings will again dominate in the trenches giving them the opportunity to walk away with the win. If they can refrain from committing stupid penalties and if they can take proper care of the football, then they could very blow the Saints away. I expect this game to be a mixed bag and a close one. Both teams want it so bad that it will be more than entertaining and stressful for us diehards. When it comes down to it, I think the Vikings will win. 31-28, Vikings win… on an overtime field goal from Ryan Longwell. I sure share your fears of a slow start by Favre. As I’ve said before, the guy just looks way slower moving and older from last year. Doesn’t have that “Pop” he usually has. If he can stay upright and get the ball off quick, our passing game only needs to augment AD’s 175 yards rushing & 3 TDS. If our secondary can play above themselves and Favre do his thing, I agree, we win and maybe blow them out. I can’t wait to see what havoc Jared and Ray-Ray wreck on Brees. Now, to find a way to make the game start right now. I don’t want to wait anymore. Do you think the Vikings are in New Orleans tonight? The thing about Favre’s slow start is accurate, but keep in mind that the two seasons you mentioned had him joining a brand new team, which is not the case this year. Sullivan’s play is my concern. Like you mentioned, he was the weak link last year, but after watching the o-line in the preseason, it’s obvious we NEED him on the field. That’s a scary thought. There is no depth there whatsoever. It’s been a long time coming !!! Brett does seem to look slower, Hopefully he is alright. Thats right Adam, 1 day. Make that 1 Warren Moon day! Well it looks like Sullivan will gat the start. Starr, sorry, game is still a day away. Do you remember where you read that??? I don’t remember. Could have been on the ‘Trib’s site. Why be so damn soft on them Cal? Kill them all and take their gold and women too! Yeah Baby! the Vikings are coming! Vikes need to play great and score early. Gotta get the crowd out of it which should help the o-line. I see Souhan, Zulgad and Scoggins are picking the Saints. I really hope they choke on it. I hope they choke too but probably not, unfortunately. I just can’t see them holding up enough in the secondary too offset Brees & company. It’s early in the season and Favre is a late starter, going into the worst environment as far as a home field crowd. The best chance we have is this thing turning into a shootout. 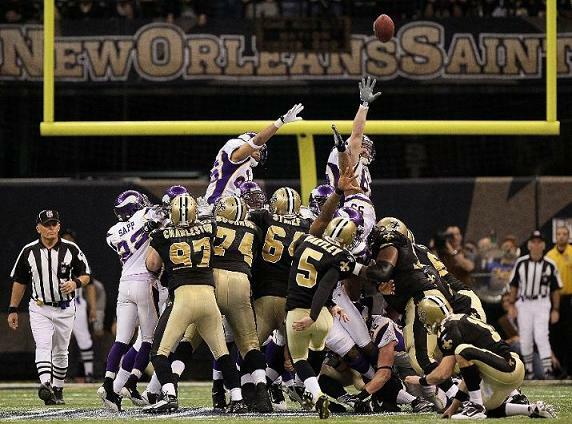 That will mean keeping Favre vertical enough to find receivers and our secondary keeping the Saints under 30. Going to be a wild one, I hope. Hey Charlie! Pellisaro at ESPN said Sullys listed as probable on the injury report which means he will play. The guys over at the Pioneer Press are 4 out of 5, for the Saints. Man, where’s the love for the home team? Griffin is listed as questionable, so he may still get some playing time. Everyone acts like its so crazy that he could play after only 3 practices, but he has been practicing with the DB coaches after practice for a long time, so its not like he’s been completely away from the team. If he is healthy, I see no reason he couldnt come in and play in nickel/dime packages. Here’s how it broke down at the ‘Trib. Fran, If memory serves me correctly on the old AV days, Chip is a Titans fan. Could be wrong on the team but he’s not a Vikes fan. Ya’ll have a good day. Right on cc! Great closer to your numbers game. Every year, a cluster of vested veterans (i.e., players with four or more years of service) are unsigned before Week One because the base salary of every vested veteran who appears on a Week One roster becomes, as a practical matter, guaranteed. After Week One, some of those players are signed, since their base salaries at that point aren’t guaranteed. But the race to sign them doesn’t begin when the last game of Week One has concluded. It starts when each team has concluded its first game of the season. This gives the teams that play on Thursday night a head start of more than two-and-a-half days to get those players under contract. In all fairness, the trigger should be the same for all teams. But two teams won’t be complaining about it this year, if they’re hoping to sign one or more of those available vested veterans — the Vikings and the Saints. Wow, that’s a new one on me. Never heard of it. Of course how many “Vested Veterans” are out there and who are they? Just found out that Tony Richardson (FB) is a vested Vet. Dump Tahi and pick this guy up!! It’s all about the pass rush tonight. Ray Edwawrds needs to bring his A game so that he can reap the benefits of double teams on Jared, Kevin, and Pat. I’m a natural pessimist, but I’m still thinking we win tonight. AP has a chip on his shoulder. He wants to prove that he’s better than CJ2K and that he won’t fumble anymore. And when AP has something to prove, you better watch out. I’m also looking for the refs to be calling EVERYTHING, given their performance last game. They’ve probably taken a lot of flak regarding the late/not late hits on Brett. If we can score early, that’ll shut up all those Bourbon Street drunks. Then it will be time to grind it out on the ground. We need to eat that clock like a pizza at a Weight Watcher’s meeting. Hey Adam isnt today the due date for baby Freds? How awsome would it be if little Freds was born right after a big Vikes win over the Saints? Johnny your the best !!! Vikings are going to get an early late hit penalty on Brees (probably Allen – although I like Robison as the dark horse hit man) – not condoning, just predicting . . .